The limelight falls on Hyun Joong and Prince Jung this episode! We get to see some pairings though they’re not solidified yet. Episode 13: Bunny love and how to take care of a man child. The boys are finally preparing for their debut as they have a photo shoot, but they’re all so awkward (haha). It’s like awkward smiles and poses all around from the boys while the president and the photographer try to guide them. The photographer tells them to smile and he’s liking the minions smiles but not Prince Jung’s. So he has a serious face on instead (hehe). 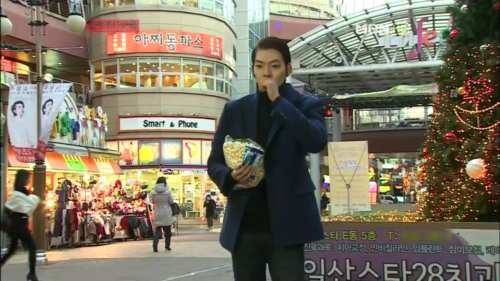 Hyun Joong is walking around with popcorn, unaware that some girls are staring at him, he smiles shyly when he hears them (hehe). His super hearing picks up something popping and that is when a little girl gives him a bag of Pop Rocks, a type of candy that pops in your mouth. He thanks her and pops some into his mouth, but he wasn’t prepared for the shock of it literally popping in his mouth so he falls. She hands him a balloon and takes a picture. She hands him the polaroid, but he tells her he doesn’t have money. She gestures that he doesn’t need to pay and just take it. When Hyun Joong gets home, he shows them the polaroid and Soo Hyuk seems to be more fascinated by the balloon (hehe). 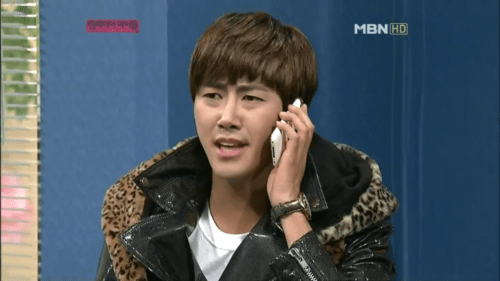 Prince Jung says first it was the telemarketer and now this person? Hyun Joong is for sure that she is the one this time. Prince Jung: What kind of girl is she? Prince Jung: What? An animal?! 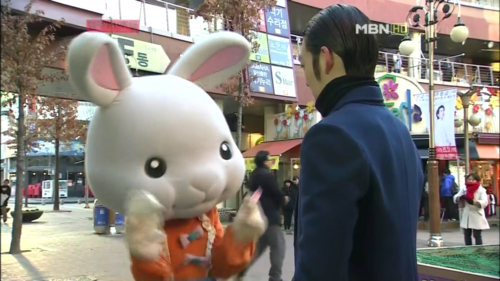 Hyun Joong tries to explain that the girl is in a bunny mascot outfit, but Prince Jung won’t have it. Just like his heart, the balloon pops. Yu Bi waves hi to him as he walks dejectedly, but he doesn’t say anything. She asks him what’s wrong and he says he got a present (the balloon), but now it became deflated. Hyun Joong asks what she thinks of him since before he was considered ugly but here he is considered good looking. Is he good looking? Yu Bi shows a thumbs up which makes him happy since Toki (rabbit) probably thinks so too. He tells the story about the balloon and polaroid and she agrees that Toki probably thinks so. Hyun Joong asks her it’s okay for him to ask Toki on a date. He then asks Yu Bi why she doesn’t speak and she replies that she just doesn’t. He asks her why and she texts out this huge explanation, but retracts it. She just shows a happy Pucca icon and tells him to do well with Toki. He thanks her and leaves. Hyun Joong waits for Toki at the same spot with origami rabbits. He hands the gifts to Toki which makes it very happy and in turn he’s happy. Hyun Joong asks Toki out on a date tomorrow, same time as today. Toki thinks about it and nods which makes Hyun Joong super bashful (heeee). The vampires wake up the next day and the president whisks them off to hair and makeup. They sit in chairs like curious little boys as the stylist do their magic. The minions come out with different hair, but Prince Jung’s is the still the same which makes him confused (haha). Prince Jung gets dropped off at the company and he wonders where his minions are. The president tells them the three still have some things to do and tells him to go inside first. Prince Jung tries to open the door, but it’s locked which leads him to sit outside in the cold. Min Kyung finds him and the look of happiness on his face is so cute (haha). She takes him to the Chinese restaurant that she works at and tells him that to stay there while she goes out and delivers some stuff. The owner asks him what he would like in a fake Chinese-Korean accent which Prince Jung doesn’t understand (LOL). Min Kyung introduces the owner as the president of this restaurant. Prince Jung looks at him and asks why he wears a dress when he’s a man (LOL). He even lifts up the owner’s outfit which causes the owner to call him a pervert. Prince Jung still can’t understand what the owner said. Min Kyung explains to the owner that Prince Jung is a foreigner so he’s not familiar with things. Prince Jung even mocks the way the owner speaks like a little kid (haha). Kwang Hee is giving himself a little pampering when his new manager comes in with a cappuccino. When the manager accidentally spills his coffee, Kwang Hee goes into diva mode and gets mad at him. The manager’s had it with the attitude and he quits though Kwang Hee shouts that he’s fired. He calls up the president and asks him to get him a new manager. The president hangs up and sighs. Kyow! Do the minions look great with their new ‘do. I guess this means the Santa Claus episode was shot after their transformation in this episode. The minions are posing without their leader as they take pictures with their label mate Girls Girls. Soo Hyuk is paired with Woo Hee and Brunette, Hyun Joong with Yu Bi, and Jong Hyun with Minah (must resist shipping!). 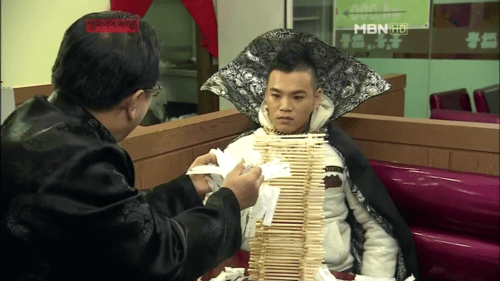 The owner gets mad at Prince Jung for wasting chopsticks by building that huge jenga/castle structure and gets even more mad when Prince Jung mocks his accent. 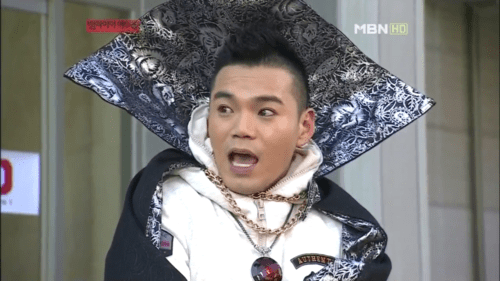 The owner says something which gets even Min Kyung shocked. Min Kyung ends up taking Prince Jung with her on her delivery and he admires her motorcycle which is totally his style. She tells him to stay there and not touch anything. 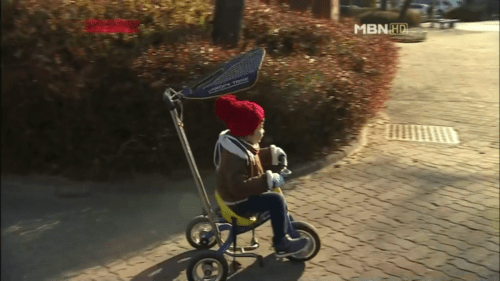 However, he sees a little kid ride a tricycle and gets some ideas….which leads to him crashing her motorcyle. The gang is done with the photo shoot and the girls compliment the minions on how cool they look. The minions talk among themselves, still flabbergasted that they are considered good looking. Hyun Joong and Jong Hyun call each other handsome, but to Soo Hyuk, Prince Jung is the handsomest (aww). Jong Hyun says that’s a given and suggest going home since Prince Jung must be bored. Manager Shin and the president of discussing about how Kwang Hee’s managers don’t last long when the president gets a phone call. It’s from Kwang Hee and the president shouts that he’s looking for one. Manager Shin says with Kwang Hee’s temper and such, it’s difficult to find a person. The president suggests that Manager Shin be Kwang Hee’s manager which motivates Manager Shin to call for people (haha). 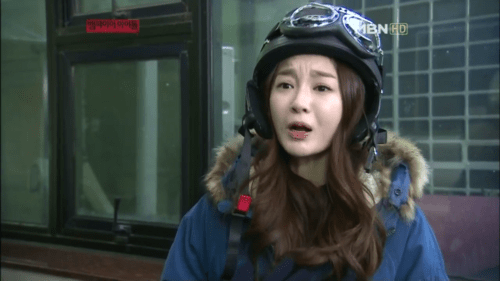 Min Kyung gets worried when the mechanic tells her it’ll take a while for the car to be fixed. She then gets a call that surprises her. She goes back to the jimjibang to find Prince Jung’s tongue and face are stuck to the block of ice (haha). The lady complains about Prince Jung and Min Kyung tries to alleviate the issue, but they get kicked out. Min Kyung has to take her luggage and leave. Prince Jung tells her she’s hungry and she’s not in the mood to play along. She tells him that when he crashed her motorbike, he was sorry so that’s okay, but how could he still behave like this. Prince Jung tells her to calm down and asks what’s wrong. She wonders how could he not understand how this world works even if he did live in Africa. Both her homes are now gone and he asks how could this have happened (ohh…dear). She pushes him and gives up. She doesn’t want to see Prince Jung again and doesn’t want him to follow her. Sumi walks into her room to see Hyun Joong trying out different clothes, he has a date today but no clothes to wear. Sumi is surprised that he’s going on a date with a human girl since she’s not dinner or anything (something like that). Anyways, Sumi helps him out and lets him wear one of Manager Shin’s suits (I think). The girls look shocked and Minah tries to hold in her laughter. Yu Bi fixes his outfit with a hat, arm warmers, and a handkerchief. In my opinion, it looks kinda weird, more like something you would see in a fashion photo shoot….perfect for the picture…not great in real life. I prefer suits to be suits. But the girls like it and give him the thumbs up. Hyun Joong thanks Yu Bi and says he’ll tell her all about it when he comes back. Hyun Joong waits nervously at the spot, but after a while of waiting, he slowly realizes that Toki isn’t coming. Min Kyung is sitting there feeling glum when Prince Jung rides up in a scooter. He tells her this is hers and if she likes it. She sits down and says it’s pretty nice, but where did he get it? Prince Jung gestures to the street and she quickly gets off in time to confront the angry owner, while Prince Jung hides behind her. 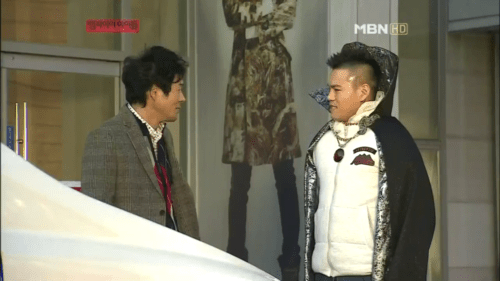 Min Kyung tells the owner to calm down and that Prince Jung came from Africa. 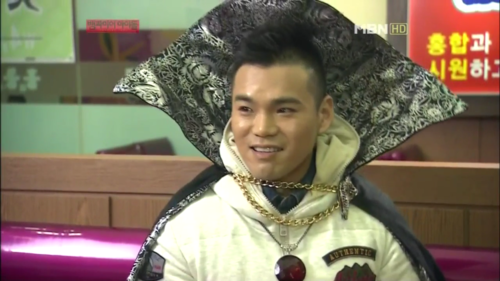 The Chinese restaurant owner comes out to ask what the problem is which is when Prince Jung shoves him into the owner. 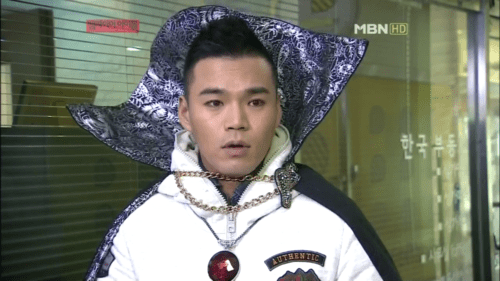 He takes Min Kyung and runs. The girls come back and Yu Bi finds Hyun Joong sitting there depressed. She takes out an envelope and hands it to him, it’s a polaroid of Toki with a caption. The caption says that Toki had something to do so she couldn’t make it, they should go out another time which makes Hyun Joong hopeful and happy. He hands Yu Bi back the hat and thanks her. She tells him that he doesn’t need to thank her since they are friends. He says thanks friend and bids her good night. When she gets to her room, she places her hat in a drawer along side some clothes and a familiar pink origami bunny. Prince Jung asks her where she’s going to go and she’s not sure, she’ll probably stay in a hostel (?) which surprises him. Meanwhile, the minions are worried since they haven’t seen Prince Jung all day and the president says for sure, he dropped off Prince Jung at the company. Manager Shin explains that at that time, Sumi wasn’t home. Hyun Joong hears someone and they all turn to see Prince Jung walk in. The president shouts where did he go and Prince Jung shouts back that today he was busy (haha). He tells someone to come in and in comes Min Kyung with her luggage. Manager Shin recognizes her and asks if they ordered food. Min Kyung is bashful, but Prince Jung isn’t. He announced that from here on, Min Kyung will live with them. The president gets angry and throws a slipper at Prince Jung which Soo Hyuk blocks. Soo Hyuk’s ready to attack, but Prince Jung stops him while Manager Shin holds the president back. The girls are woken up by the ruckus and Kwang Hee barges in, demanding to know where his new manager is. Manager Shin takes this time to announce that his new manager will be Min Kyung! Yay, finally Min Kyung is now part of the wacky household! I was waiting for this moment since she hasn’t been in every episode, but now we get to see her adorable self hopefully for every episode! How much do I love that Prince Jung is so easily influenced by children which makes sense since he’s the biggest manchild I’ve seen, excluding 1000 Ways To Die. He’s so fussy, no wonder he has three caretakers though I wonder how he will change or if he will once he realizes he likes Min Kyung. What will ever happen to our other couples too??? More Soo Hyuk x someone? More bromance? Jong Hyun x Minah? Hyun Joong x Yu Bi? Brunette x gochukjang? haha. Oh no…it’s time for me to go and do some homework now…depressing life, but here’s some Soo Hyuk eye candy for those fans out there! when will yu-bi show her face~ aww i like hyun joong & yu bi couple! Ooh, you’re fast! Care to give any spoilers on potential couples? I’m dying to see if any of the vamps/girls pair up other than the obv bbabba and minkyung! potential couples? hmm i think minkyung will end up with one of the vampire boys. and the other girl in the group which seen to be with no one, will end up with kwanghee. lol. its not the determined pairing but the signs are showing in the latest episodes =) i’ve been following until the latest episode now. Oh, this is so great. I came across your page a week ago as I was looking for subbed version and I found this treasure. Thanky you so much. Are you going to continue? Please, please. Of course, school is more important :-)) Hope everything goes well. I really appreciate your effort with the recaps. It´s really great. Some episodes are so funny that even my very very limited Korean catches the point. The “brunette” girls name is actually Suyeon =D YAY! So now we know all the girls name! Are you planning to recap this sitcom the whole way? I know its 120 episodes but it would be amazing if you could! Why did you stop recapping this? 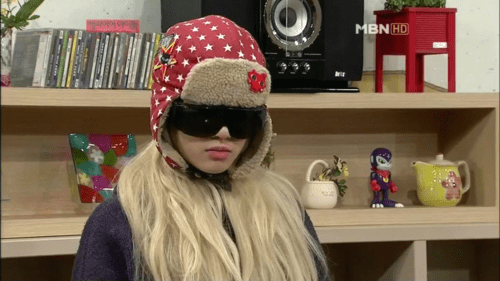 I need recaps or subs, please. Ad your recaps explain everything so well!